The fan motors are TEFC type with IP55 weather proof, Class E insulation. Fans are driven by vee belt and the speed can be adjusted by changing pulleys to meet different requirement. 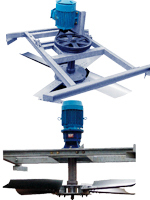 By locating the motor on top of fan stacks, the vee belt lengths are shorthen thus ensure linger belt life. Motor mounted in the outside air stream and with gear driven system are also available upon request. 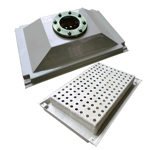 FRP cold water sump tanks contain all connection fittings and make inspection or maintenance of fittings easier. Depressed sump tanks provide basin depth and less chance of pump cavitation. All supporting steel members are hot-dip galvanized (HDG) to minimize rust forming and corrosion , ensuring long service life. Stainless steel (SS304 or SS316) hardware members are also available upon request. HDG sturdy and stable perimeter handrail on top of tower and caged ladder provide safety access and walkway for maintenance and inspection. Stainless steel handrail and ladders are also available.